You cannot imagine how I crave for summer picnics right now! Deliciously snoozing in the sun, laying on the grass, eating french breads and sun-dried tomatoes; or watching the sun go down, drinking wine, wrapped in a blanket. And of course, barbecues should not be forgotten. Dreaming about this makes me able to sit out winter. Especially a nice, soft, flowery patch of grass is requisite for spending those summers. Even better is it when the field consists of patches of moss; plaids are definitively not needed then. I cannot grasp the current paradigm of the 'perfect' moss-free lawn. There exist even special herbicides, techniques and year plans to kill the tiny first signs of bryophita in one's lawn. Grass needs quite some nutrition. 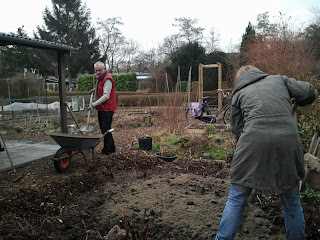 Before winter, we mixed the soil in our garden with dung from the neighboring petting zoo and extra black soil. We covered it with wood chips and other shredder residue. Because of this mulch-cover, the ground was constantly scalding and snapping the plant materials to make a fertile arable land. So this first demand could be checked off the list. The second one was to make the soil fresh and permeable, since grass does not like wet feet, and we do not like to sit on humid ground. We ploughed up the soil and mixed some sand with it (watch out you don't cut these long, slimy buddies in two with your spade). Sand makes a perfect drainage; between the tiny stones the water can seep far into the ground. The third step is to level the plot and remove big stones and root. We did this by raking it, and we leveled it by eye. After this we tamped the soil by walking over it step by step. Having prepared the soil, it's sowtime! It goes best when you grab some seeds in your hand and sprinkle it loosely back and forth. It's very meditative. Do not cover the soil completely. When you're finished, rake the soil to cover the seeds a little and to distribute the seeds more evenly where needed. Now let it rain and you're done! Just a few side notes: make sure you make the lawn in a rainy period, because it needs a lot of water to sprout. When there is too much sun and warmth, the grass seeds will dry out immediately when laying on the surface. On the other hand, a little warmth is needed to make the seeds sprout. The accompanying barbecue made of left-over bricks will follow later. Promise. Updated 23-3-2012 (after two weeks of sun and sprinkling): It grows!! !